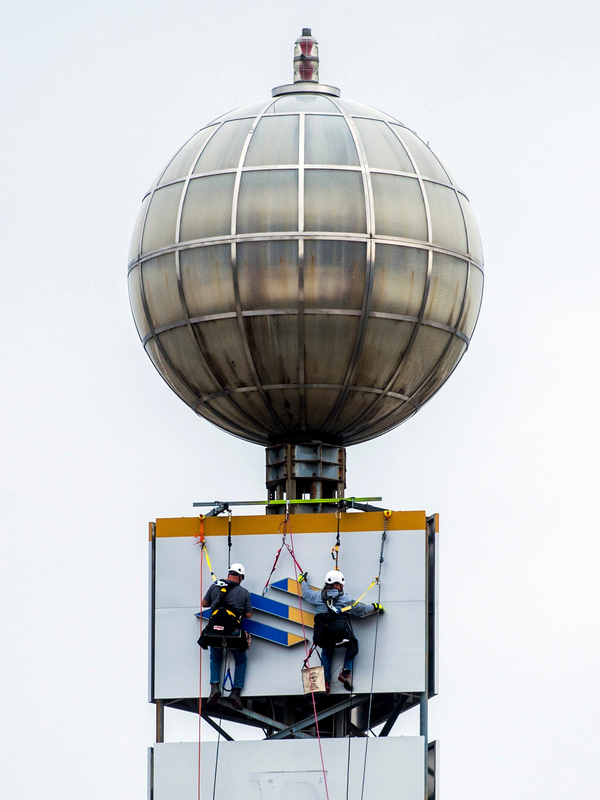 FLINT, Mich. (AP) — A tall, looming weather ball in downtown Flint that informs residents of sunshine or precipitation is changing its lettering. Crews this week are removing the “FM” for FirstMerit Bank on the 5,000-pound tower that lights up red, blue and yellow to signal weather predictions, the Flint Journal reported. The change comes after Ohio-based Huntington Bank acquired FirstMerit for $3.4 billion in January 2016. The decades-old weather ball will now display a green and white H and B. “The overwhelming feedback is it’s an incredibly important part of our community, an icon, and we need to keep the integrity of it,” said Greg Viener, Huntington Bank’s senior vice president and community president. The company is working with the Sloan Museum and the Genesee County Historical Society to preserve the old “FM” letters. The weather ball was installed in Flint in 1956. The ball turns red to signal warmer temperatures ahead, blue to alert imminent cold temperatures and yellow to signify no weather change. It also blinks to signal precipitation. “I always say just keep it red, especially at this time of year, give people hope,” Viener said.